I believe when you go to a new restaurant for the first time, you should go with as many people as possible in your party so you can order a nice selection from the menu for everyone to share and try. Last week we took a friend of ours to the Double Crown. This was my wife and I's second visit but we were happy to go to see the changes, if any. 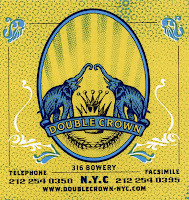 Our first visit was two weeks in to the opening of the restaurant last year and this time first off we noticed that the Double Crown became quiet popular with hip and the trendy. For a week night around 7:00Pm restaurant was completely full. I guess it's a good thing considering the shape of the economy. Before our meal we started at the Madam Geneva for few cocktails. 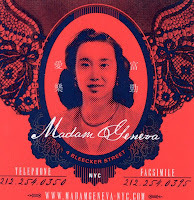 Madam is located in the back of the Double Crown with its own entrance on Bleecker Street. The ambiance is quiet different than the Double Crown, there is a long bar by the entrance and low table with comfortable chairs scattered around the space. It seems like they stripped place to its raw brick walls then painted over it preserving some of the character. Madam and Double Crown share the extensive Cocktail list along with"Hawker-Style" Snacks and Starters. Our first round of drinks included Cucumber, Apple and Elderflower Tall (Zubrowka Bison Grass Vodka, apple, elderflower, wild honey, cucumber), The Perfect Gimlet (The Perfect Gimlet) and Kumquat, Red Chili and Elderflower Smash (Belvedere Pure, kumquats, lemon, elderflower foam) all around $10 to $12 each. I like my single malt, vodka martini or g&t but sometimes I just go for the exotics, specially if the ingredients are fresh made. I would be inclined to try some others that sounded really good at our next visit, we had to save room for the wine with our meal. Cocktails are well made but there is a bit of a delay even before 7:00 p.m. so I would be prepared to wait if you are planning a visit after 8:00 p.m. The front dining room at the Double Crown was almost full with the exception of four tables at 7:15 p.m. There were also few chair available at the bar. 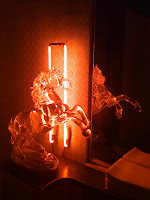 If you don't have a reservation I suggest to sit at the bar or try to get a table at the Madam Geneva. We were seated promptly after checking our coats. According to the assistant manager they have a custom-mixed soundtrack playing anything from the 80s British hits to Middle Eastern lounge tunes. Our waitress greeted us with menus and asked our water preference. At the Double Crown they serve the British bottled water Hildon from South of England. We ordered a bottle of Sancerre which was good but thought a bit overpriced. While we were deciding on the food we wanted to try some of the "Hawker-Style" Snacks so we ordered the Braised Pork Belly, Salt & Pepper Sepia and the Duck Steam Bun. Again all very good and tasty but the special mention goes to the Pork Belly. Once we made up our minds with the starters, mains and the sides we ordered the Smoked Mackerel Salad and Seared Yellowtail as starters. Twice-Cooked Chicken, Bangers & Mash and Elk Wellington as mains. Pickled Cucumber, Crispy Brussels Sprouts and Garam Masala Potatoes for our sides. After a wonderful meal we didn't have much room left for dessert but we ordered the Bitter Chocolate Trifle and the Burnt Citrus Tart to share. In conclusion, everything came to our liking and we enjoyed them thoroughly. The food was excellent and the service was even better. We did feel a little squashed with a very little elbow room but I guess that is to be expected from a popular village restaurant. We will return but most likely on an early, off night like a Sunday or a Monday. 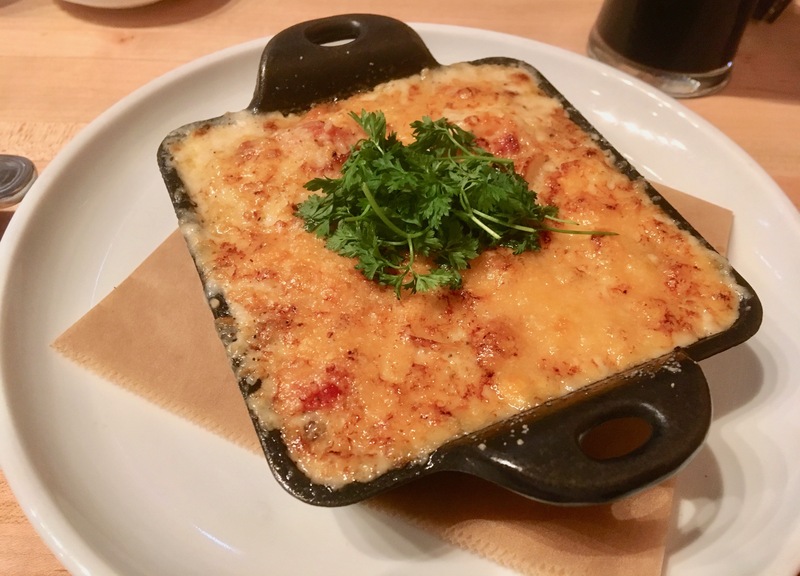 We looked at their brunch menu and it looks as good as the main menu so a return visit for a brunch will be planned as well. Pros: Global menu to try various cuisines prepared masterfully. Great cocktail menu. Cons: Seats are very close to each-other. Gets loud. Limited wine selection.